Rock n Roll Machine Manufacturer in Chandigarh, Rock n Roll Machine in Chandigarh, Rock n Roll Machine Supplier in Chandigarh, SD Engineering works is the manufacturers and exporters of Rock n roll machine in Chandigarh. Our company offers the best rock n roll machine for our clients in Chandigarh. Our rock n roll machine is working on a completely automatic operating cycle. The offered machine is manufactured by SD Engineering works skilled professionals in compliance with set quality standards from premium quality components and progressive technology. 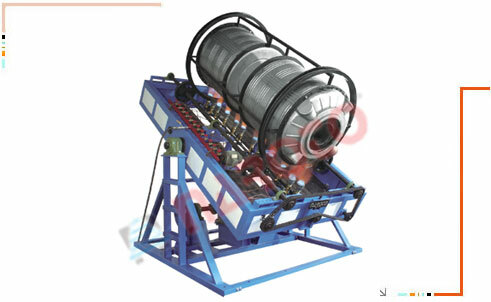 SD Engineering works is the manufacturers and exporters of Rock n roll machine in Chandigarh. Our company offers the best rock n roll machine for our clients in Chandigarh. Our rock n roll machine is working on a completely automatic operating cycle. The offered machine is manufactured by SD Engineering works skilled professionals in compliance with set quality standards from premium quality components and progressive technology. Ø Loading/unloading operations on cooling stations at ground level. Ø Up to 4 airways for every arm.